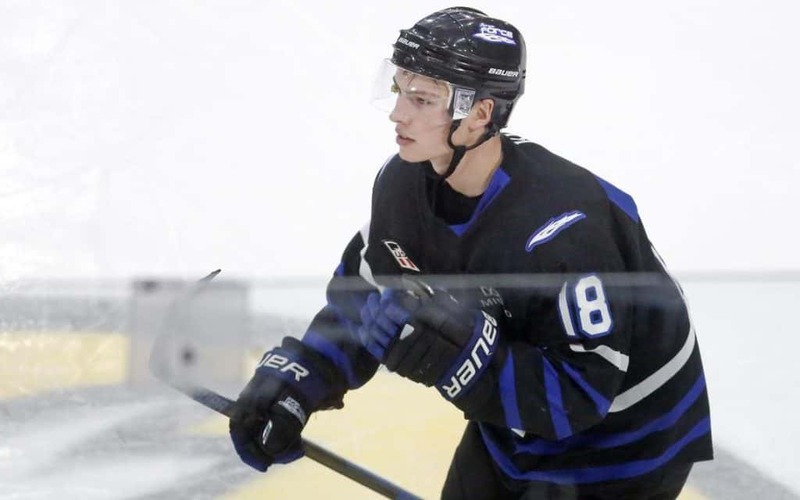 FARGO, N.D. — Fargo Force defenseman and University of North Dakota commit Ethan Frisch has called Moorhead home for his entire life. His dad and uncle both played high school hockey for the Spuds. His two aunts were professional figure skating coaches, so he’s been skating since he was 2 years old and had a hockey stick in his hand by the age of 3. Frisch still has some of his Moorhead jerseys in his closet from his high school seasons. 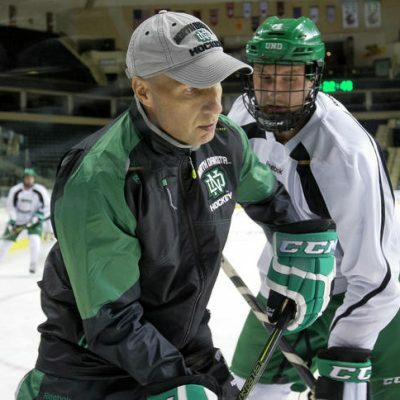 Last summer he told the Moorhead hockey coaching staff he needed to meet with them. Moorhead varsity hockey coach Jon Ammerman said he pretty much knew what was coming. Frisch told the Moorhead coaching staff he was not coming back for his senior season with the Spuds. He was going to go to Green Bay to play with the Gamblers in the United States Hockey League. He said it was the hardest decision of his life. Frisch had 20 points in 31 games as a sophomore, helping lead the Spuds to the Minnesota Class 2A state championship game. He had 28 points in 28 games as a junior, as the Spuds lost in the section championship game. After his junior season at Moorhead, Frisch played 14 games with Green Bay in the USHL, notching six assists and a plus-minus of plus-5. Something new to Frisch this season was dealing with losing. Throughout his hockey career he was never on a team even close to .500. Green Bay finished this season as one of the worst teams in the USHL. Frisch was along for that ride for the first 41 games. While Frisch was experiencing losing in the USHL, the Spuds were en route to winning a section championship without him. Frisch never second-guessed himself and never stopped cheering for the Spuds. 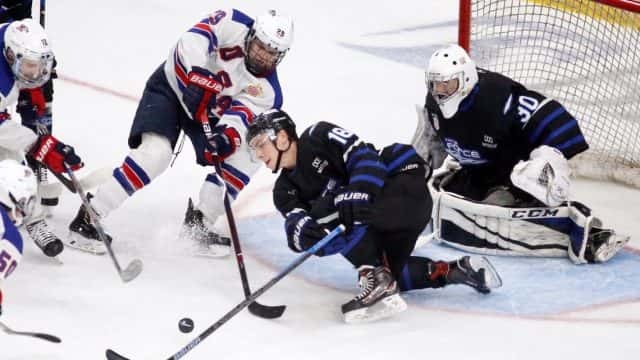 In February, Frisch got the other side of the USHL. 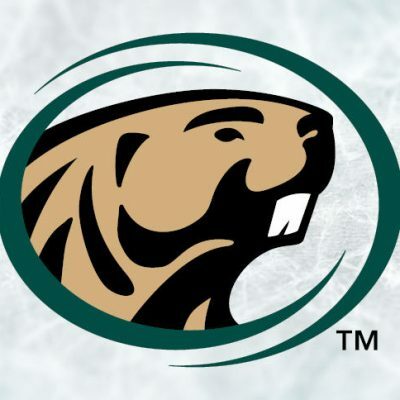 Green Bay was looking to rebuild and the defending Clark Cup champions were looking for help defensively for their playoff push. Fargo head coach Cary Eades knew there was more to Frisch than his 14 points and his plus-minus of minus-22 with Green Bay. 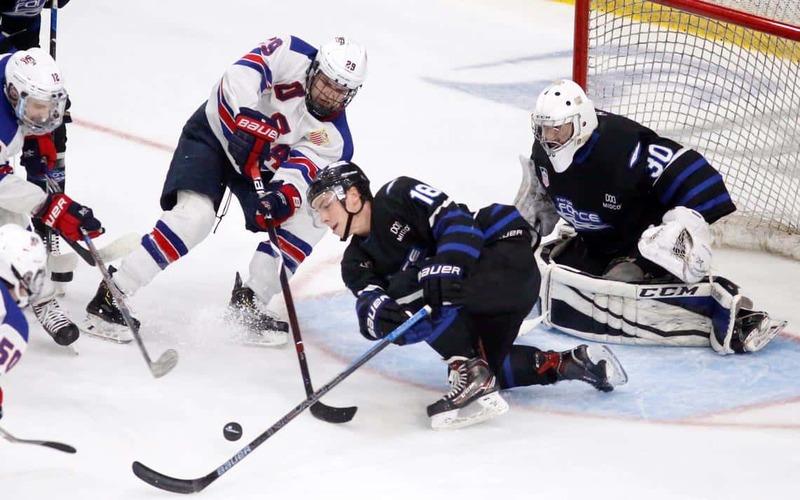 Eades has watched Frisch develop since he was playing youth hockey. 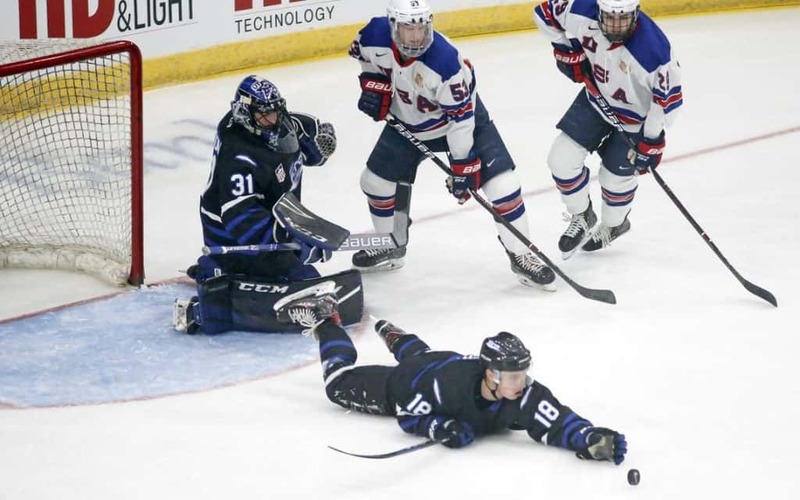 Frisch has three points in 16 games with the Force and a plus-minus of minus-1, as Fargo prepares to open the USHL playoffs in a best-of-three series at 7:05 p.m. Monday at Des Moines. Less than three years ago, on Oct. 24, 2016, five days before his 16th birthday, Frisch committed to UND before ever playing a high school hockey game. Since then, he’s helped lead the Spuds to a state championship game, played in Hockey Day Minnesota, been part of a documentary following the Spuds hockey season and had to make a decision to move to Green Bay and skip his senior high school hockey season. All that’s in front of him is the USHL playoffs, heading to UND next season and most likely being a late-round draft pick in the NHL draft this June. He’s beginning to learn the business side of hockey, but it’s still a game to him. It’s a game that’s brought him ups and downs, difficult decisions and Moorhead hockey apparel he still wears. It’s a game he says a prayer before. It’s a game he’s learned to step away from to hunt, fish and just sit inside with family and friends. It’s a game he can step away from, but not a game he can imagine living without. “I wouldn’t want to be in any other place,” Frisch said. “I’ve got to experience a lot of things a lot of players will never get to. It’s been a fun ride, and I can’t complain at all.